I don't see anything. Is that the point? Oh, that is the Zen pipe, wrong forum Fred, you were looking for the ZBPS forum. (Not to be confused with the mainline BPS forum or (TBPS forum) as they can’t stand each other after all the zen guys are all into experimental meditation and motorcycle maintenance). How abut a Seventh Belgique pipe to commemorate Dante's Inferno? Thanks for the kinds words, guys. I do want to keep working on that tulip shape. It's fun to make. I'm not sure yet whether I'll stick with the diamond shank for it or go to a more traditional round shank. Del, I do hope that someday my pipes get to the Good, the True, and the Beautiful, but I'm afraid my skill set is a long way off from that yet! Personally, I think it might look better with a round shank and a thin fishtail stem. I'd also keep the overall pipe small with delicate proportions. That's just me though. And the overall impression that a tulip flower is growing on a naturally round stem. I think you're right about the fishtail stem being the right shape for a tulip. I don't want to make it look too "girly," though. I mean, I'd hate to think that some pipe smokers would be sexist enough to reject a pipe on the grounds of the girly-ness of the design, but my customers are probably 85% men. (And most of the women who buy them are getting them as gifts for their boyfriends.) 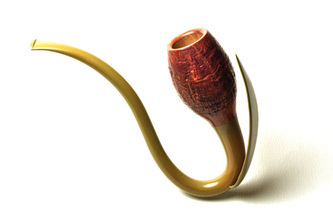 I just remember picking up a very delicate-looking pipe with a floral motif and thin stem, and my wife's first remark was "that's a girly pipe." So maybe now I'm just paranoid about the whole issue. I think you can make small, delicate pipes and avoid being girly about it. These huge pipes that everyone goes gaga over nowadays were a rarity back in the day. There's something to be said for the finesse it takes to work small too. And a small pipe is a joy to clench. Flowers aren't inherently girly. That great stache needs a big ol' author, a bulldog, or at least a bent Apple hanging underneath!!! Hey now. Jesus has been called the "Rose of Sharon" and the "Lily of the Valley". Granted, you have to put yer typological hat on to make sense of it, but still. What do you think of that last pipe I posted? Would you let it touch your lips? Yes. We share similar tastes in pipes. Many is the time I've wanted to plunder your hoard and I was touched when you asked if you could have mine when I died. You are correct. I've noticed that I more often appreciate the beauties you, wos, and A_Morley post than I do, say, Goose. Not sure what that says about me theologically?